BFGoodrich g-Force T/A KDW tires are designed as high performance summer tires that provide incredible grip and traction on both wet and dry pavement. 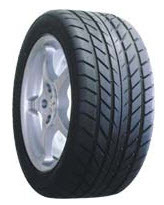 Called KDW (Key Dry Wet traction), these tires are built for higher end sport coupes and sedans. The outside of the tire features a unidirectional tread pattern which is specially designed to give the ultimate in wet or dry handling and traction. Larger tread blocks aid in more stability at high torque levels, while BFG’s new Black Tech technology sports better grip regardless of whether the roads are wet or dry. Add G-Control sidewall inserts and you have a beast of a tire in the corners. Circumferential grooves, which are wider and deeper than normal, greatly reduce the risk of hydroplaning and eliminate more water from under the tread. This is some of the same technology that you’ll find on BFG racing tires. Another noticeable area that will surprise some drivers is in how quiet the tire is relative to what type of tire it is. It rides like a touring tire out on the highway and provides a smooth comfortable ride. Inside the tread are twin steel belts with polyester casing plies and BFGoodrich’s exclusive ETEC system, which takes nylon strips and spirally winds them to produce exceptional tire strength when driving at much higher speeds. Overall, the g-Force KDW does what it says it will do, and it does it very well. It’s little wonder why reviews have been as positive as they are. BFG has a winner with this model. Prices on the TA KDW range from around $150 for the 16 inch series to upwards of $225 for the massive 20 inch tires. Who Are BF Goodrich g-Force T/A KDW Tires Designed For? BFGoodrich Tires has developed the g-Force T/A KDW for drivers of high performance sport coupes and sedans who are seeking a maximum summer performance tire that grips the road in wet or dry conditions, while also still providing a comfortable ride. BFGoodrich Tires does not warrant the g-Force KDW with a tread life guarantee, which is not that unusual for tires like this. However, you will get a one year warranty on the tire’s uniformity. Materials and workmanship are backed for 6 years and includes first year or 25% of wear free tire replacement. The tire is then prorated until the final 2/32 inch of useable tread is left.